Most people wouldn’t normally use ‘Japan’ and ‘cheap’ in the same sentence because the country is known for its high cost of living; but believe it or not, traveling Japan on the cheap is doable. There are unavoidable, unnecessary expenses (Hermione’s wand I bought at USJ for 4500 yen not included haha) that we can all skip spending on or at least cut down to the minimum. A friend and I visited Japan in October 2016 and our four-day stay in the Kansai Region didn’t exactly break the bank. Here are a few tips on how to make your Japan trip come true without jeopardizing your savings account. 9. Grab the flight deal while you can! One of the biggest mistakes I did was not trusting my instincts when they clearly said, “Book it! Book the flight!” If I hadn’t waited on someone because I was afraid of traveling alone, I would have only spent Php6,500 on my airfare, which was Php3,000 cheaper than what I actually paid for in the end. Two months later, a good friend said she wanted to come with me, so I didn’t have to worry about being alone anymore. 8. Focus your trip on one area/region. Many Filipino travelers try and compress two far away cities in one trip. For instance, some spend a few days in Tokyo and another few days in Osaka or Kyoto. While that’s totally fine, a bullet train ride can be overly expensive. The money you spend on it could very well be spent on another travel destination, say Hong Kong or Singapore. Concentrate on traveling to neighboring cities to save on transportation costs. My friend and I mainly stayed in Osaka, but we also paid visits to Kyoto and Nara, which were also in Kansai Region. Also, think about this: if you’ve been to Japan, there’s huge chance you’re going to get your Visa approved the next time you go. You might even be extra lucky and get yourself a multiple-entry Visa to travel the rest of Japan with. Trust me when I say that cheap hostels in Osaka are sort of underrated. My friend and I didn’t expect we’d be enjoying our stay at either J Hoppers or Hotel Toyo, but we did. Nothing fancy, but the rooms were cozy, the bathrooms were clean; the staff was friendly and accommodating; and each night only cost Php1,092 and Php782 at J Hoppers and Hotel Toyo respectively. 6. Make wise use of free Wi-Fi. One thing we didn’t get to do at the airport before we went to the hostel was rent a pocket WiFi. In Japan, you’ll be surprised to find out that many stores close early. Money changers close at 6PM, although there are mall branches that close at 9PM. We arrived at the Information Center in Kansai Airport at 9 o’clock in the evening when most shops were already closed. The last trip to Universal City Walk was at 9:10PM, so we had to hurry to catch the bus. Since there was Free WiFi at the airport, I got to check our hostel on Google Maps and figured that it was just walking distance from the bus stop. We did the same strategy when we were at the hostel. We Googled how to get to various places and utilized the free WiFi while we could – and it worked: we didn’t get lost. Of course, it could have been easier if we had a pocket WiFi. It would also help to do your research before the trip and try to familiarize yourself with the train stations and station exits, and save references and maps on your phones. That way, it’ll be easier for you to roam around even without a pocket wifi or an international SIM. 5. Don’t take taxis. Take train rides. For tourists, taxis may be the most convenient option to move from place to place, but let’s face it: they’re not practical. The whole point of traveling is to experience a foreign country as if you’re a local, so why not take the trains like the most of the populace and get to see sights while in transit? The minimum fare for this is 120 or 180 Yen, a lot cheaper than a taxi. 4. Plan your meals ahead. If you’re in Japan, you might as well try authentic Japanese food. However, that doesn’t have to mean you have to cash out some more for it. The technique is to plan out which meals to splurge on and which meals not to. For example, on our first day, we spent 1000 yen each on lunch at Three Broomsticks inside Universal Studios and then 200 yen for dinner on the same day. On our third day, we spent 450 Yen on lunch and 800 Yen on good old ramen at Ichiran for dinner. Ichiran Ramen – to die for! You can also save on food without relying on convenience stores. I know, that’s what you read as tips to save on Japan travel, right? There are many small restaurants you can try out to get a real Japanese food experience. There was one we tried in a Shinsekai neighborhood, for example, called ‘Oh Ho’ and their servings are huge! 3. Bring your own tumbler or water bottle. Bottled drinking water in Japan costs 150-200 yen each; that is around 75-100 pesos – quite expensive if you consider they only cost around 10-30 pesos here in the Philippines. Fill up your tumblers/bottle at the hotel or hostel you’re staying in. Their tap water is clean and safe to drink, so don’t forget to stock up on fluids before you leave the hostel, especially if you plan on traveling during the summer. Universal Studios Osaka is a must-see, particularly because it houses the only Wizarding World of Harry Potter in Asia. It’s not exactly budget-friendly; but if you must go, be sure purchase vouchers ahead via booking websites. Honestly, my friend and I didn’t buy vouchers when we visited USJ, and we regretted it; but we’ve booked online multiple times for activities in Hong Kong, Singapore and South Korea. Some booking sites offer the best deals and prices and will surely help you save on your next trip. Theme parks have got to be the some of the most expensive parts of international travel. When we went to Japan in October 2016, the entrance fee for Universal Studios had already increased from 7200 to 7400 Yen. To cut down on travel costs, see to it that you explore areas that don’t charge entrance fees. Many temples in Kyoto charge around 500 to 600 Yen, but only if you enter the temples. As long as you stay in the outer grounds, it’s free. Fushimi Inari Shrine is probably one of the most popular tourist destinations in Kyoto. We arrived at the shrine at 5PM and even when darkness fell, the thousand tori gates still looked beautiful. The Arashiyama Bamboo Forest is another sight to see in Kyoto. Even with a huge crowd, it’s still a very peaceful place to be in – a good place to get away from the hustle and bustle of the city. In Osaka, there are also plenty of places you can check out without paying for anything. Tsurumi Ryokuchi Park, for one, is a commemorative park east of Osaka Castle where you can see different varieties of beautiful flowers. The windmill is a very picturesque part of the park especially if there are red tulips around (which wasn’t the case when we were there). A few train stations away from Tsurumi Ryokuchi is the famous Osaka Castle where families spend their weekends and have picnics, the old and young alike jog in the early morning, and private groups hold their team building sessions. There’s a 600 Yen entrance fee if you want to enter the Castle, but I hear the inside has received a modern update on its interiors, so you might just want to settle with looking at the castle from outside. Dotonbori and Shinsaibashi-suji are the most popular shopping areas in Osaka. It’s not hard to miss because there’s a river dissecting the Dotonbori shopping district in the middle, along which there’s a floating stage where you can watch musicians perform. The famous Glico running man signage (the popular band that created Pocky) is found just past the Don Quixote store in Dotonbori. Everyone says it’s mandatory to take a photo with the Glico man. Named the best cheesecake in the world, Pablo is one of the many spots in Shinsaibashi that never runs out of excited, hungry customers. I bought a medium-sized cheesecake to bring home and a mini Pablo, which I ate on the flight home. You cannot go to Dotonbori and not try Takoyaki. Sure, there are stalls offering cheap Takoyaki all over the Philippines, but they’re not really takoyaki. Haha. The thing is, Takoyaki has a small cut of octopus inside and believe me: even though it was still too hot for me to munch on, it was just so good. By the way, nine pieces of Takoyaki cost 500 yen. You see, traveling to Japan on a budget is not impossible, it just entails discipline and a whole lot of research and preparation. Researching for the best hotel/hostel deals, preparing for DIY tours instead of booking travel packages, studying routes and train stations near your hotel can help you make budget travel – and not just in Japan, either; but in other popularly expensive countries. Check out my article on how you can go on a budget trip to Seoul, South Korea here. For a more detailed breakdown of this budget trip to Japan, read the author’s blog post here. 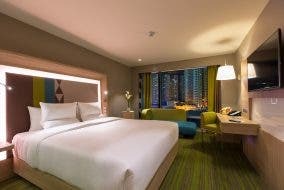 Novotel Manila Araneta Center Offers Great Staycation Deals at the Philippine Travel Mart Expo from Sep 2-4!